"The Best of Enemies" is another formulaic biopic about race, but it recognizes that white allyship is only really valuable when it’s hard. Robin Bissell’s “The Best of Enemies” may not be some kind of game-changing corrective to all the retrograde films about race in America (we’re talking about an uplifting historical biopic directed by the executive producer of “Seabiscuit”), but this sturdy drama has the good sense to recognize that allyship is only valuable when it’s hard. When it’s a sacrifice. When it forces white people to put some of their own skin in the game. Feel-good Hollywood movies about race in America — specifically the ones that are meant to assuage white audiences of the latent guilt they feel about the historical and ongoing treatment of black people in this country — tend to hinge on the concept of friendship. And not just any friendship, but true friendship. The clumsy Eddie Murphy vehicle “Mr. Church” was “inspired by a true friendship.” So was “Green Book,” even if the truth of its friendship is more complicated than Nick Vallelonga might have us believe. Sandra Bullock won an Oscar for giving this dynamic a maternal twist in “The Blind Side,” which was “based on the extraordinary true story,” while “The Upside” — a recent hit that was merely “based on a true story” — still managed to make an extraordinary amount of money. Of course this phenomenon might owe less to the movies than it does to how they’re marketed, but it’s hard not to feel like the white men who directed these dramas (and/or the white audiences they directed them for) are skeptical of the idea that they might have anything in common with people of color. “Inspired by a true friendship” isn’t a tagline so much as it is a receipt; a preemptive defense against how fun and easy such films make it seem for someone to unlearn their racist worldview and put centuries of messiness behind them. “The Best of Enemies” isn’t inspired by a “true” friendship, but rather by an “unlikely” one. That may be a small (or even semantic) difference, but it’s also one that emphasizes the work of social concord over the relief of an unburdened conscience (“An Unlikely Friendship” also happens to be the title of the short documentary that Diane Bloom made on the subject). Which isn’t to suggest that Bissell’s film isn’t based on a true friendship, because it is — a friendship much truer than the one between Tony the Lip and Don Shirley. More to the point, that friendship was owed to a compelling footnote of American history, a fact that “The Best of Enemies” milks for all it’s worth. This is still a soft and naïve slice of kumbaya pageantry that’s more compelled by the white hero’s transformation than it is by the black co-lead’s courage and integrity, but there’s an undercurrent of honesty to the story that it tells, even if there’s something a bit skewed about how that story is told. Then again, with movies like “Green Book” setting the bar so low, it’s only so much of an accomplishment for something else to step right over it. Bissell’s debut is set during a tense and transformative few weeks during 1971, when the racially divided city of Durham, North Carolina was in crisis over how to implement court-ordered desegregation (the film quite literally fans the flames of that tension by having one of the black schools burn to the ground and displacing all of its students). The state receives $78,000 to solve the issue, and that money is used to pay for remarkably even-keeled Raleigh organizer Bill Riddick (a note-perfect Babou Ceesay) to come down and host a charrette. If “The Best of Enemies” does nothing more than reintroduce Americans to the concept of a charrette, then the movie might still have to be considered a step in the right direction. A peaceful means of resolving community stalemates, a charrette is a series of meetings in which a representative committee of local leaders forms a senate, hears public arguments on both sides of an issue, and then arrives at a solution via binding vote. The process is intimate, neutral, performed in good faith, and basically the opposite of how national politics works in 2019. Riddick knows that the charrette will be a total charade if he doesn’t appoint the most outspoken members of the white and black communities to head the senate, and that’s what leads him directly to C.P. Ellis and Ann Atwater. Ellis (Sam Rockwell, who may have been born with a devastating condition that makes it physically impossible for him to pass up any chance to play a tender-hearted racist) isn’t just a white supremacist, he’s the president of the Durham KKK. But if his inevitable disenchantment with bigotry is less dramatic than, say, Edward Norton’s in “American History X,” that’s because Ellis always seems a bit wishy washy about who he’s supposed to hate and why. He’s not an ideologue, he’s just a super chill social racist. Maybe we can work with that? Some of the film’s most compelling scenes find Ellis grappling with how blinding it is to feel like you belong somewhere — with how tempting the devil’s bargain can be to a dirt-poor kid from a broken home who just wants to be part of something bigger than himself. By day he owns a gas station, and by night he leads an army. Bissell’s script is never more nuanced than when it harps on hatred as its own closed-off form of togetherness; one early scene keys in to the fun that Ellis and his right-hand man (Wes Bentley) are having as they scare the hell out of a white girl who’s dating a black man. 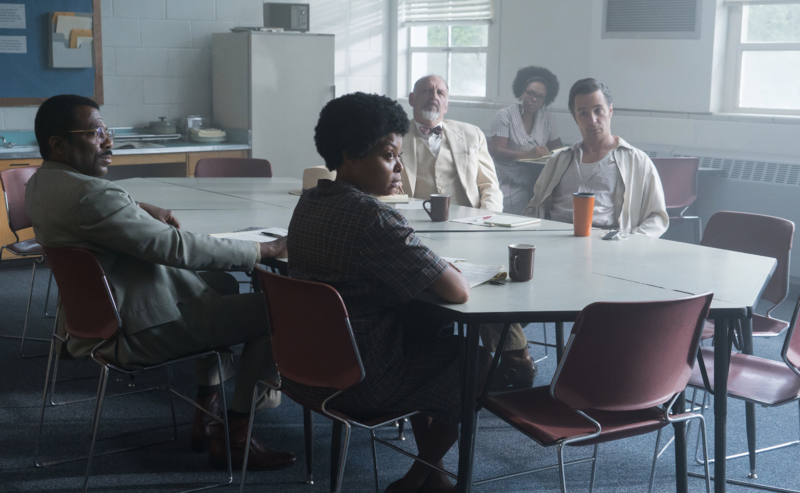 More labored is the extent to which “The Best of Enemies” uses Ellis’ love for his Down Syndrome-afflicted son (Kevin Iannucci) as an Achilles’ heel — as a leak in the hull of his hatred, and a way for Atwater to reach him. But, like many of the movie’s eyebrow-raising grace notes, that detail checks out. Biographical fidelity doesn’t excuse clumsy storytelling, but it can help smooth over some details that feel too “good” to be true. Anne Heche makes a welcome appearance as Ellis’ wife, but the character never comes anywhere close to being more than Ellis’ wife. In the opposite corner from Ellis is civil rights activist and single mother of four, Ann Atwater. Atwater was 33 at the time, Taraji P. Henson is 48, and the makeup and hair departments have conspired to make her character look closer to 65, but a lifetime of walking uphill has a way of wearing people down. Age discrepancy aside, Henson is more than up to the task, even if the script reduces Atwater to little more than a symbol of America’s oppressed communities. Henson brings a moral clarity to every scene, but Atwater’s only arc is a slow appreciation for Ellis’ growth, and she isn’t granted any of his emotional texture; her four kids have less combined screen time than Ellis’ daughter, who does exactly nothing. Bruce McGill and an almost unrecognizable John Gallagher Jr. deliver excellent supporting turns in a long movie that reserves most of its spare time for men. And yet, in other respects, “The Best of Enemies” is shaped with an arresting sense of balance. While this may have been a stronger film if it had started with Ellis tearing up his KKK card — if it had done more to grapple with the violence of white supremacy, and dug even deeper into Ellis’ role in the day-to-day upkeep of progress — the relative subtlety of Rockwell’s enlightenment makes it possible for prejudiced viewers to follow him down the same road. Seen through a certain lens, this movie could be even-handed enough to seduce those who still can’t see things clearly. By the time they see through the false equivalencies and realize the deck is stacked against them, they might be ready to fold their hand. Or not. It’s dumb to endow a formulaic costume drama with so much power when these movies are never going to be able to do our dirty work for us. If “The Best of Enemies” is among the better ones, that’s because it never fools itself into thinking that it can. STX Films will release “The Best of Enemies” in theaters on April 5.